Against all the odds, ignoring everyone who said they couldn’t win and shouldn’t be there — none of that mattered. The Cardinals believed in themselves, even back in late August when many of the team’s fans quit believing in them. And now, the ultimate reward. And it came as a true team effort. Last night’s win was a good example of that — Chris Carpenter starting on three day’s rest for the second time ever, and having a rough first inning where he gave up two runs. The Cardinals bouncing back right away, with David Freese tying the game by driving in Albert Pujols and Lance Berkman. CC then settling in and being the intense competitor he is for five more innings. Allen Craig hitting a go-ahead homer to put the Cards up 3-2, scoring two more runs on a bases-loaded walk and bases-loaded hit by pitch, Yadi driving in the final run on an RBI-single. And the bullpen, overcoming the challenges of earlier in the Series and settling in — with veterans Arthur Rhodes and Octavio Dotel and kids Lance Lynn and Jason Motte all shutting down the Rangers. And that was it — Cinderella story complete, a World Series winner! An amazing moment, whether you were there in person or watching on TV or sharing the moment via phone with a loved one (as I had to, calling my nephew Drew to watch the ninth inning with him). A time to celebrate, absolutely — is there any greater joy than seeing the team you’re so devoted to as the last ones standing? And especially this team, this season. And they can be our motivation for always, whenever the going gets tough. As Joe Buck said in calling the final out of the game, what a team! What a ride! 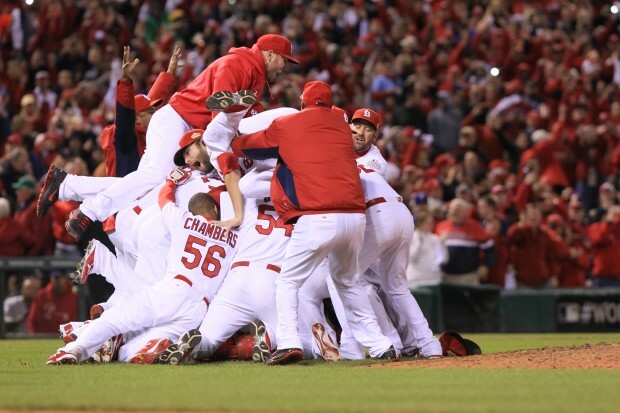 The Cardinals are World Champions in 2011! This entry was posted in 2011 Season by Christine Coleman. Bookmark the permalink.